There’s no mystery to why Webkinz toys are still so popular after five years on the market. Hmm, start with a cuddly, plush toy and link it to a virtual world that lets kids take care of it, play games, interact, buy cool stuff and generally frolic. What’s not to love? 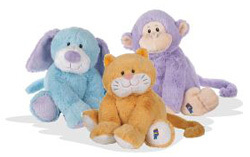 And now, parent company Ganz has expanded with a line of toys and accompanying website for younger children, Webkinz Jr.
Made specifically for children aged three to six, the plush animals are bigger, softer and easier to cuddle than the original Webkinz. And the website is simple to navigate without parental help (no reading required), though we don’t suggest leaving younger children alone on the computer without adult supervision. Online, kids can do all kinds of things with their pet, like garden, take a nap and play with others at places like school, the park and the playhouse. 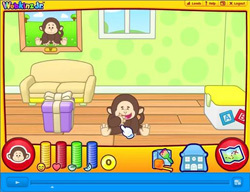 There are also educational games that teach basic skills like shapes, letters and numbers. The Parent’s Area allows you to adjust the difficulty levels on the site so you can customize it for your child as he or she grows. So how does it work? You have to buy a Webkinz Jr. toy (which starts at about $20 on Amazon.com), then use the included pet code to register online at webkinzjr.com, or you can purchase a code online starting at $25. The account lasts for just one year, so after that, you’ll either have to go out and buy another animal or purchase a subscription to the website.